Nokia unveiled two Windows Phone handsets today – the Nokia Lumia 800 and 710, but none of them got a specific release date for the elusive for the Finns US market. This doesn't mean, though, that the company isn't planning to widen its presence on US soil. Stephen Elop explicitly stated that there are phones planned for the huge North American market and LTE network support is in the plans. 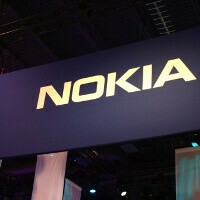 Not only that, Nokia will also release CDMA devices for carriers like Sprint and Verizon. Sadly, that's not anytime soon and CEO Stephen Elop himself confirmed that Nokia will miss this Holiday season stateside and only arrive early 2012. Now, this all you might have already heard if you've followed the live webcast and our liveblog, but what you might have not known is the fact that Verizon representatives were at Nokia World as well. To be more precise, Thisismynext spotted a Verizon staffer around the Nokia Lumia 800 booth. Combine LTE, CDMA and Verizon, and you arrive at a pretty tempting combination. Moreover, this confirms that Nokia has been hard at work at fixing its spotty relationship with US carriers. Will it manage to deliver an up-to-date portfolio in the dynamic American market? Chime in with your opinions in the comments below. This is GREAT news for a WP nut case like me. If we bolt for Verizon, I am getting a Droid 3 that will tie me over until Big Red gets a WP handset I like. LTE supported Nokia? That sounds like a potential winner!! Invasion? The amount of MEH.... In Nokia's announcement was very disappointing. I'll keep my HD7. Unless At&t successfully buys T-Mobile then I'll get a Titan. Tiny sub 4" screens are acceptable for budget minded smartphones or for girl phones like the iPhone. Other than budget minded or girl phone(iPhone) there's no reason to have such a tiny screen. Dude, 4.3" and higher are nice and all, but not for serious use. I need a phone that can be controlled with one hand. Oh and after all, there will be Nokia 900 with 4.3" screen (and WP). only if you're a "big manly man" is under 4" acceptable. what are you doing on your phone anyway? watching all the sports live tv stuff? do you do anything like texting or real phone calls? because if all you use your phone for is watching movies and playing angry birds sure i could agree with you. Im glad to see this. I hope they do come to sprint, they havent had a sprint phone in several years. Their support for verizon is bad also but not nearly as bad, so I have no doubt we'll see a Verizon windows phone from them. Drop the 800 and 710 from Verizon... Verizon should not even shelf them... If Nokia plans to come to the US and to Big Red... THEY NEED THEIR A GAME. Nokia needs a "hero" device, especially if it wants to bang with the big boys in the US. They need the 4+ inch screen, 1800+ battery, 1g+ ram, 32+ gb, 8+ mp camera (+strong apeture capability, carl zeis lens), front facing camera, 4G capability and a badass cpu. If this comes in the form of a Nokia 900, great. If not, WHY NOT UP THE ANTE, Nokia 1000 anyone? Why be another smartphone, when you can be THE smartphone? Especially in such a critical moment in the company, you gotta focus and produce BIG and "AMAZING EVERYDAY"... as in more AMAZING than EVERY OTHER PHONE.